Senate Democrats say President Donald Trump isn’t paying for his border wall from other parts of the government’s budget because doing so would require approval from Congress. The statement was the latest volley in the standoff over passing a funding bill. Trump, who vowed to make Mexico pay for the wall along the border, is insisting that any budget plan include U.S. funding. Democrats are refusing. If the standoff is not resolved, parts of the government will shut down at midnight Friday. Senate Majority Leader Mitch McConnell says he’s confident that there will not be a partial government shutdown, but discussions are continuing. The White House says it’s waiting to see what the Senate can pass to prevent a partial government shutdown. Press Secretary Sarah Huckabee Sanders said the Senate has “thrown out a number of ideas.” She said that when something passes, the White House will evaluate it. Sanders says President Donald Trump has asked every Cabinet secretary to look for funding that could be used for border security. Congressional leaders have been negotiating since the White House indicated earlier in the day that Trump does not want a federal government shutdown over his demand for $5 billion for the border wall with Mexico. Democratic leaders are spurning a proposal by the top Senate Republican to avert a partial government shutdown over President Donald Trump’s demand for $5 billion for a border wall with Mexico. Senate Majority Leader Mitch McConnell proposed $1.6 billion for border security, as outlined in a bipartisan Senate bill, plus another $1 billion Trump could use on the border, according to a Democratic aide unauthorized to speak publicly about the private meeting. The White said Tuesday that Trump might accept the Senate bill if other money was also available. Senate leaders are negotiating to avert a federal shutdown over President Donald Trump’s demand for $5 billion for the border wall with Mexico. In talks Tuesday, Senate Majority Leader Mitch McConnell proposed $1.6 billion for border security, as outlined in a bipartisan Senate bill, plus an additional $1 billion that Trump could use on the border, according to a senior Democratic aide unauthorized to speak publicly about the private meeting. Democratic leaders Chuck Schumer and Nancy Pelosi have proposed $1.3 billion. That money would not be for a wall, but for border fencing. Earlier Tuesday, the White House indicated Trump may be willing to accept the Senate bill, if other money was also available. White House press secretary Sarah Huckabee Sanders says the White House is willing to work with Congress to avert a partial government shutdown. She says, “That’s something that we would be able to support” as long as it’s coupled with other funding, such as using defense money on border security. 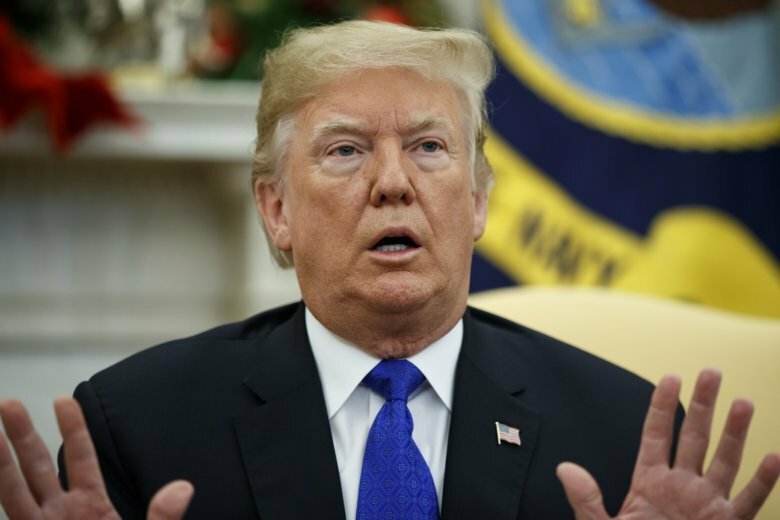 Few if any signs of progress are emerging as President Donald Trump and Democratic lawmakers continue their standoff over funding the government and avoiding a partial shutdown at midnight Friday. The main sticking point is Trump’s demand for $5 billion to build a border wall along the U.S.-Mexico border. Even a partial shutdown would leave hundreds of thousands of federal employees furloughed or working without pay over the holiday season. Costs would likely be in the billions of dollars. Trump doesn’t have the votes from the Republican-led Congress to support his demand for border wall construction. Democrats are offering to continue funding at current levels, $1.3 billion, not for the wall but for fencing and other border security.